Have you ever thought about starting powerlifting, but didn't know where to begin? Editor’s note: This article is an op-ed. The views expressed herein and in the video are the author’s and don’t necessarily reflect the views of BarBend. Claims, assertions, opinions, and quotes have been sourced exclusively by the author. This article is the first part of a three part series breaking down how to begin in powerlifting with a program for the absolute beginner. With New Year’s Resolutions being a major topic for the first portion of the year, I figured this could be a great time to talk about how a beginner in fitness can get involved and succeed in powerlifting for 2019. After seeing an ample amount of people on social media struggling to find an enjoyable training and nutrition program for their fitness goals — I believe that getting involved with powerlifting could be a good answer for many. Not only can powerlifting support fat loss while keeping a focus on strength, but it can also allow you to feel satisfaction and confidence that isn’t focused solely on body image. In fact, taking the focus away from appearance in this sport has been seen to help improve my (and other’s) feelings towards our bodies and ourselves. Powerlifting can be a great tool to help you feel empowered and find passion in a hobby, rather than participating in an exercise such as long-duration cardio, which for many, may feel more like a chore day-in and day-out. If consistent exercise feels like a chore everyday, then motivation can run low. Powerlifting when done with intent is not that way for most people. In short, powerlifting is a sport that can help lift you up and give you strength in all aspects of your life, and that is one of the major reasons why so many are getting involved with it and why you should, too. Who Is This Powerlifting Guide For? Chances are, you’ve probably tossed the idea to the side because you saw it as nearly impossible to ever be in those shoes. Don’t doubt yourself so soon. This guide is going to show you how to go from a complete beginner in the gym to a skilled strength athlete with an eight month training plan laid out for you. Don’t expect to deadlift 400 pounds this year, but expect to be on the right path to getting there. With consistency, you’ll be closer than you think. The eight month guide in part two will explain the importance of planning and programming for success, injury prevention, slow progressions, technique, basic barbell movements, and nutrition, which will all aid in your shift to becoming a powerlifter this year. If you’re nervous about your start, you’re not alone. I don’t think there’s a single person who has started training on their own for the first time that has ever felt completely confident. First of all, no one wants to be caught aimlessly walking around trying to figure out what the heck they’re supposed to do with that machine, and they definitely don’t want to be caught doing an exercise with the wrong form and end up on a gym fails video. And I guarantee you’ll be better off than I was when I first started. I was doing shoulder presses and thinking that I was training my chest, check it out below. I’ll be quite honest with you, no matter what I say to comfort you, more than likely you’re still going to feel a little uncomfortable when you step into the gym for the first time. That’s normal. It’s a new environment. The uncomfortable feeling goes away within a couple of days of being there consistently. If you’re at a commercial gym, it also helps to talk to the front desk people (who are friendly and want to make you feel welcome) and typically you’ll find other members doing the same. That’s how I’ve always made my first friends at every new gym I’ve gone to. You can also join the Powerlifting Newbies Facebook group I’ve created specifically for anyone following this guide. This will allow you to connect with others in your community who are in the same shoes as you. You can also join other powerlifting groups for support, such as USPA, USAPL, or men/women-specific powerlifting Facebook groups. Despite any worries or fears you may have about getting started, this guide is going to try to make you feel as prepared as possible on your journey to strength. To get started with powerlifting, you need a plan. I’m going to take you step-by-step through this process, providing you tips and tricks along the way to leave you feeling stronger than ever at the end of this year. It’s important to realize that the guide which will come in part two is not customized specifically for you, but it’s customized for general fitness athletes like you. This means that this program and guide may not meet all of your needs. For example, many beginners in fitness have imbalances and corrections to be made in posture, form, and technique, while others may have little to no issues. Remember, the act of correcting personal technical deficiencies may take longer for you than someone else, and fixing these should remain as the main focus before progressing into the next focus or phase of the guide. This is why understanding how to plan and adjust a general layout of your training (on your own) is important. Let’s dive in first to how the eight month program will be organized and how you can adjust the plan to fit your needs to have a successful year. These planning techniques are used by professional coaches who customize plans for advanced athletes in most sports. Understanding at least the basics of how to plan a successful year will come in handy through your entire career as a powerlifting athlete. We’re going to use the terms macrocycle, mesocycle, and microcycle in this guide, and these are great terms to learn for general programming purposes, too. In strength and conditioning, the length of each cycle listed above can differ slightly based on the coach and the athlete’s specific program. For this program, our macrocycle is going to be eight months. This provides a full overview of the program. Our mesocycles in this guide will last 2-3 months, each with a different focus in training based on specific stressors we need to place on the body to adapt and progress into the next cycle. The reason we cannot jump into a strength cycle right off the bat, like many mistakenly do, is because we need to adapt to the initial stressors required for each phase. For example, your body needs to learn the skill of stabilizing, breathing, and bracing itself while training before the body can develop the skill of managing heavy loads. Imagine putting 350 pounds on your back and trying to step out from a rack, but you haven’t even managed simple stabilization skills without the weight yet. One of the keys to success in powerlifting is remaining stable and strong throughout an entire movement. 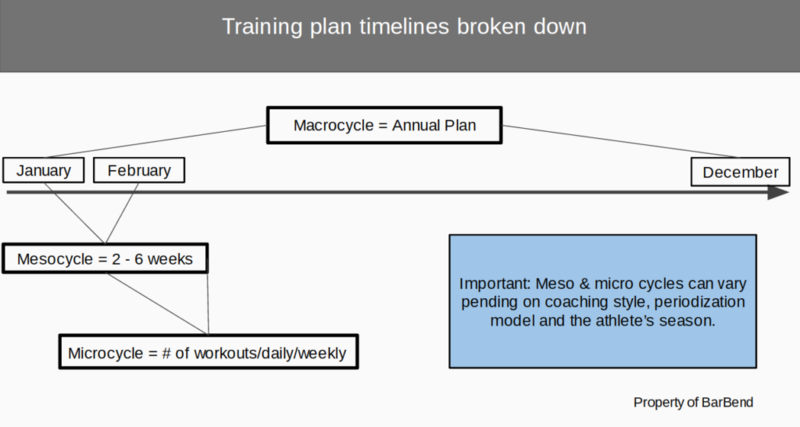 Our mesocycles will then be broken down into microcycles, which is the overview of your weekly and daily workouts. Another major mistake beginners make when attempting to become a weathered powerlifter is going to the gym and planning out their training once they get there. You may think it is a good idea to try and test your max every other day because you’ve heard that’s what powerlifters do. But realistically and typically, powerlifters only test their max once every few months (if that). The reason we [powerlifters] don’t tend to do this often is because it leaves no room for progress. You don’t get strong by continuing to test your maximal strength; you get stronger by training to get stronger and then testing your maximal strength at the end of the strength cycle. By neglecting to look at the “bigger picture”, or the macrocycle and mesocycles of the plan, you can fall short as a successful powerlifter. When Should You Compete In Your First Powerlifting Meet? I know many will be in a rush to get strong as quick as possible, but this can be counterintuitive. By rushing, we tend to dismiss and neglect key points when planning and programming, then neglect proper progressions and technique. There shouldn’t be a rush to competing in your first meet. You’ll see many people who have never walked into a gym before try to compete in 12-weeks, and this is personally not something I would recommend to most people. In my opinion, the checklist below covers everything you need before deciding to compete, and we’ll touch base on each of these points throughout the guide. Before moving forward, I want to address how “good” you should be before deciding to compete; as a beginner, this isn’t something you should focus on too much right now. You can check out what numbers other lifters in your area are hitting in competition and see where you fall within those numbers, but even after these eight months, there should be no rush to compete yet. You have an abundance of time to take your training to the next level and to ensure you absolutely kill it at your first meet. You don’t have to be the best or strongest lifter to compete, but if you feel the urge to compete before being beyond prepared, ask yourself why you’re in such a rush. Competing in powerlifting isn’t cheap and it’s something that you should take seriously when training for it. Do not rush this process, but also do not fear never being good enough; you will be. Put in the time and effort to train hard as an athlete, and when you feel ready and are able to cross everything off of this checklist, then that’s when it’s time to sign up. If at the end of this eight month program, you don’t feel prepared, then do not sign up for a meet; set up a mock meet for yourself instead. Our main focus this year is to get you from a complete beginner in training to a beginner powerlifter with a solid strength base in eight months. All with programming that is focused on injury prevention and proper progressions. Our eight months of training are going to be broken into three different mesocycles. The first third of the eight month guide consists of mostly “non-powerlifter” training styles, which are important for building a solid foundation. This will all be done through linear periodization, which tends to be most effective when just getting started in the gym. The focus is on stabilization and strength endurance, basic barbell techniques, and corrective exercise. This cycle will take three months. This phase is one I would recommend for nearly all beginners in fitness, and it’s crucial if you don’t want to end your powerlifting career before it’s even started. The second cycle is two months long and focuses on building the base for strength in a hypertrophy phase. We’ll be working with RPE’s and percentages in this cycle and this is usually where the excitement begins. You’ll feel more like a bodybuilder rather than a powerlifter, but most tend to enjoy this style of training just as much. This is where you’ll start annoying your Instagram friends with all of the flexing pictures because your biceps will be making their appearance in this phase. Our last cycle, which is the phase most people mistakenly jump into first is where you get to feel like a true powerlifter. We begin working with percentages of 75% and higher and finally lifting heavy. This cycle will take three months. In the beginning and end of this cycle, you will feel like a beast in the gym, but somewhere in the middle of programming, it is normal to feel a little unmotivated and slightly fatigued. This feeling won’t last and you may not experience it at all. The last week will have you prepared for your first mock meet. The microcycle not only depends on the main focus of each mesocycle you’re in, but it’s also extremely individual to you. This is why cookie-cutter programs aren’t always the best for everyone; a program that monitors and adjusts will get you the best success in training, which is why athletes should follow their specific programs laid out by coaches rather than ones they got from a friend. That is also why I will reiterate that this program may be optimal for you, or it may not. If you find the program in part two falling short, then you can easily adjust the guide so that it is optimal for you based on two individual aspects: 1) recovery and 2) correcting your weak points. Understanding how to adjust a general strength program to fit your needs will make training more effective for your goals. Recovery refers to how quickly you recover from your program’s workouts and training volume. This can be monitored from day to day or overtime as a whole. Your central and peripheral nervous systems can become fatigued when increasing training volume, and that’s especially true in powerlifting with high intensity exercises mixed with relatively moderate to high volumes. Incomes overtraining. Warning signs of overtraining are increased resting heart rate over periods of time, decreased training performance, a change in appetite, lack of sleep, high levels of stress, decreased motivation, decreased energy and mood, consistent illness, and becoming more injury prone. Things you should be monitoring from week-to-week are your resting heart rate, how your RPE’s fluctuate as time goes on, caloric intake, water intake, quality of sleep, stress levels, and how you’re feeling overall. Author’s Note: Remember, these are only signs and may not necessarily mean that you’re overtraining; sometimes we just get sick and life goes on, but if multiple of these signs are reoccurring, then it might be time to adjust the program and give your body a break. If you notice that you’re experiencing these overtraining signs gradually as you progress in the program, then you may need to adjust the guide and take a deload week by cutting your training volume in half before continuing on with the guide. An average deload (as a mesocycle) can be anywhere from 4-12 weeks (and that will be individual to you). If you notice you’re experiencing these sins right away in your program and it goes on like this for weeks, then this may be a sign that you need to reduce overall training volume. Keep in mind that as a beginner you may be more prone to experience delayed onset muscle soreness (DOMS), meaning you’ll feel variations of mild to somewhat extreme soreness days after workouts. Many people interpret this as one of the signs of overtraining, but it is usually DOMS and goes away as your body adjusts. Another adjustment you may need to make in this guide is based on your individual weak points in exercise. We all have them; but what they are can vary from person to person. We want to make sure that as a powerlifter you are performing exercises as efficiently as possible. To do this, we focus on training cues (part 2) and exercise selection to make your weak points stronger. For example, let’s say your bench press is slacking, then there could be many reasons for this. The biggest are poor technique or poor form. Poor technique can be corrected by better understanding training cues. Poor form is corrected by adjusting exercises to focus on strengthening under-active/utilized muscles and stretching overactive muscles. Your bench press may be slacking due to improper training cues (technique) or because your triceps are weak and causing you to fail early on your lifts. You can fix technique with better cues and fix weak triceps by slightly increasing training volume focused on your triceps. Secondary and accessory movements are what you would adjust in the program if you find that volume is too high or low for over/underactive muscles. Part two of this guide is going to take you through your first eight months as a beginner in powerlifting. Lexes is a certified personal trainer and fitness nutrition specialist. Her primary focus with her athletes and clients is strength, nutrition, and physique transformations. She runs a blog called Flex Club where you can find helpful tips and motivation to begin your journey into fitness. Her competitive side of fitness was introduced at age 3, when she began bowling in league. By age 8, she was winning scholarships in state and junior nationals and at 18 began competing in USBC Women's Championships. She first picked up a pair of dumbbells at 17 and, soon after, competed in her first NPC bikini show. After developing binge-eating disorder, she began doing more reseach on the mental aspects of fitness and nutrition. At age 22, she re-discovered the fun and competitive side of fitness, where she got into powerlifting and marathon running (the full 26.2). She has been personal training and online coaching since 2014, using her past experiences to help current clients.